Minnesota Vikings wide receiver Stefon Diggs has scored 43 fantasy points over the last three weeks, making him one of the most intriguing names on the fantasy football waiver wire. He’ll take on a St. Louis Rams defense that has a tough secondary. I’m not sure that this will be a huge outing, but Diggs should still be considered as a flex play. Pittsburgh Steelers quarterback Ben Roethlisberger returned from a sprained MCL injury last weekend, completed 28-of-45 passes for 262 yards, with one touchdown and three interceptions Sunday against the Bengals.. Not such great numbers. I think that this week, Big Ben returns to his old self, and has a big day against an Oakland Raiders defense that has allowed the most passing yards in the league. Look for wide receiver Antonio Brown to have a huge day as well. Headlines were made this week as the Denver Broncos traded two sixth round picks this week to acquire two time pro bowler, tight end Vernon Davis. This had me intrigued for the main reason that quarterback Peyton Manning loves his tight ends. Let’s take a look back. Julius Thomas had 24 touchdowns from Manning in his final two seasons as a Bronco. I think that can be Davis this season, and am highly attracted by the potential that this trade has. He does have two other tight ends on the roster to compete with (Owen Daniels and Virgil Green), but there’s a reason why Denver traded for him. I say take a number and stash Davis on your bench this week. Last week we saw many players go down with major injuries, crippling fantasy teams everywhere. Pittsburgh Steelers running back Le’Veon Bell tore his MCL and PCL, and he is done for the season. DeAngelo Williams is going to replace him, and if you were lucky enough to snag him on the waiver wire, he should be in your lineup right away. Chicago Bears running back Matt Forte suffered damage to his MCL and will be out for a few weeks. Enter Jeremy Langford. I expect him to have a big week against the Chargers on Monday Night Football. Patriots tight end Rob Gronkowski takes on the Washington Redskins this week, who have allowed the 12th fewest yards per game to tight ends. Of course, they’ve yet to face Gronkowski and I’m predicting three touchdowns today from Gronk. Atlanta Falcons wide receiver Julio Jones finally came down to earth this week, bringing in just four catches for 38 yards. That was pretty surprising to owners, as the Falcons put up 48 points in a rout of the Houston Texans. Jones practiced on a limited basis this week, complaining of tightness in his hamstring. He is active Sunday and will play the Washington Redskins. Not too many worries here, and you should keep him in your lineup. 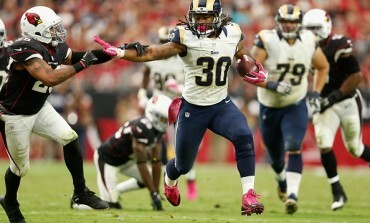 Maybe it’s my fascination with St. Louis Rams running back Todd Gurley, but he put on a show last week. Gurley ran for 146 yards in just his second career NFL game. 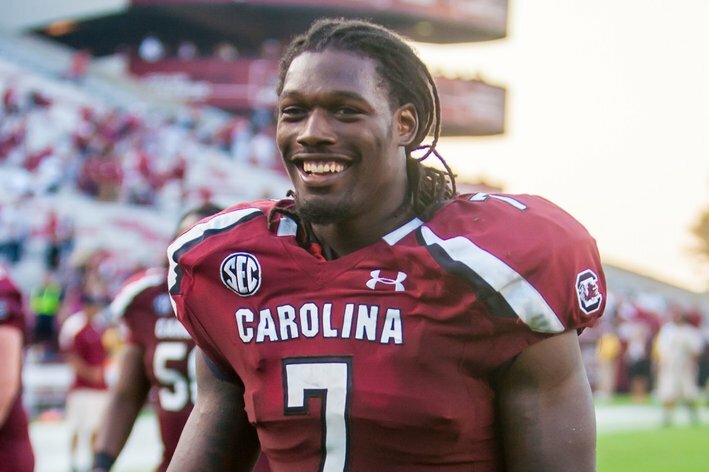 He is who we thought he was, and now he’ll look towards that first big touchdown. While he plays the Green Bay Packers this week, he should still produce numbers. Keep him locked in your lineup and get ready for Gurley to take over. New Orleans Saints quarterback Drew Brees played ok for most of last week’s matchup against the Dallas Cowboys, with the walk off 80-yard touchdown to C.J. Spiller being his big play of the day. This week, Brees heads into Philadelphia to face the Eagles, and I think that it could be another good week for the veteran QB. He’s a must start for me. Many are looking into possibly using their bye weeks to pick up a possible replacement for their players sitting out. One of these players to look in to is Kansas City Chiefs quarterback Alex Smith. Smith is at home Sunday against the Chicago Bears and that is an interesting matchup. Smith has the second most dropbacks in the entire league right now, and with a weak Bears defense, Smith is an intriguing play. After weeks of frustration in Seattle, strong safety Kam Chancellor ended his holdout and returned to practice this week. The Seattle Seahawks are 0-2 headed into their home opener on Sunday, and with Chancellor back in the mix, look for this defense to return to being one of the league’s best. 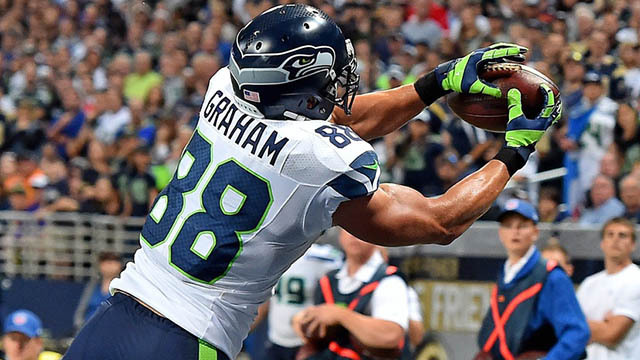 While we’re on the topic of the Seahawks, tight end Jimmy Graham made headlines this week when it came out that Graham was frustrated with his reduced role. Now as I pointed out a few weeks back, we knew that this would happen. With an elite running back like Marshawn Lynch, the Seahawks are destined to run the ball. Graham is being utilized as a blocker right now, but don’t expect him to NOT make an impact. Graham has the second most red zone targets (four) out of all of the league’s tight ends (New England Patriots tight end Rob Gronkowski has the most with five). Expect Graham to catch some for touchdowns. Now is the time to buy low on Graham. I think we were all shocked by the three touchdown performance by Arizona Cardinals wide receiver Larry Fitzgerald. Now, this was against a weak Chicago Bears defense, but the hype is real. I believe that Larry Fitzgerald proved that he is not done yet. Expect a healthy dose of Larry Fitz as he takes on a weak San Francisco 49ers defense. With news that New York Jets wide receiver Eric Decker is out this week, the number-two receiver slot is up for the taking. With Chris Owusu also out this week, timing couldn’t be better for second round pick Devin Smith to make his NFL debut. Smith was a long ball threat and speed receiver at Ohio State, and I’m expecting him to channel that with the Jets. You probably won’t see a big impact immediately, but with the possibility that Decker might miss multiple weeks, Smith could be a sneaky addition to your fantasy team in deeper leagues. With news of the Philadelphia Eagles setting DeMarco Murray inactive for week three, running back Ryan Matthews will get the start against the Jets. This is where I stay away, as the Jets have the fewest fantasy points allowed to opposing running backs. Then we head to the other Matthews for the Eagles at wide receiver with Jordan Matthews. This is my “buyers beware” player of the week. Jets cornerback Darrelle Revis will likely be on Matthews for the entire game. This matchup would essentially take Matthews out of the game and out of your lineup. 1. Jay Cutler- The Chicago Bears have said that Cutler will be their starter next season, although that doesn’t necessarily mean that they aren’t listening to offers for him. With the trade for Brandon Marshall, bringing in Cutler could be very bad for the Jets, due to chemistry issues between the two. However, bringing in Cutler could be a good situation, as the pair may have just needed a change of scenery. 2. Colin Kaepernick- No shot. He’s been mentioned in media reports as a player that is bound to be traded, but I don’t see it. 3. Ryan Fitzpatrick- With news of Brian Hoyer headed to Houston, the Texans are set to release Fitzpatrick to free agency. The Jets are definitely in the mix to sign Fitzpatrick, and he’d compete with Geno Smith for the starting quarterback job. 4. Jameis Winston / Marcus Mariota- If I were running the Jets, I’d take this option and start from scratch. A new coach and a new general manager after a four win season should signal a new quarterback. I do not see Winston slipping out of Tampa Bay’s hands and he’ll probably be the first overall pick. However, I do see Mariota slipping. If you look at the draft order, the only teams that I could look at drafting a quarterback in the first six picks are the Bucs, the Titans and the Jets. I see Winston going first, but cannot see the Titans using their pick on Mariota, because I think they could fill a bigger need with a defensive player. Jacksonville, Oakland and Washington all have young developing “franchise” quarterbacks. Then there’s the Jets at six! Mariota would be huge for the organization and would signal light at the end of the tunnel. 5. Sam Bradford- Let’s say Mariota does slip to the sixth pick. Chip Kelly’s Eagles are reportedly interested in trading up to the sixth pick to draft the former Oregon quarterback and reunite him with his former coach. 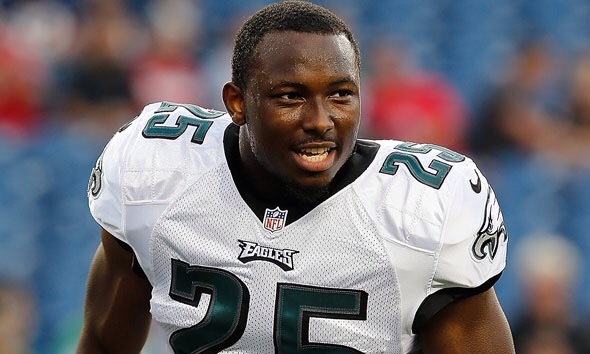 The return on a possible trade could be rather large, and is fairly certain to include recently acquired Eagles quarterback Sam Bradford (who was acquired Tuesday for Nick Foles), in addition to a few first/second round picks. In this scenario, Bradford would not play one snap for the Eagles. I’d think that Mariota wouldn’t lead the Eagles far in his first season, especially after the Eagles lost wide receiver Jeremy Maclin, resulting in a high pick. Also, how’d that RG3 trade turn out? The Rams used all of their picks and turned them into key pieces for their franchise. Pure speculation, but this kind of a trade could pay off for the Jets. 27 Arizona Cardinals (From NO) Deone Bucannon S Washington St. The Cardinals traded No. 20 (Brandin Cooks) to New Orleans for No. 27 (Deone Bucannon) and their third-rounder, Pick No. 91.